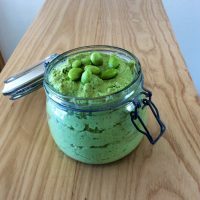 This Japanese inspired soya bean dip is a great and tasty alternative to regular hummus and although there is much controversy surrounding soy, it has some fantastic health benefits – everything in moderation! The soy oil found in the bean contains omega 3 fatty acids that are similar to the ones found in oily fish and it can prevent blood clotting, great for heart health and so beneficial for the ones suffering of heart disease and high levels of cholesterol. Soy contains also phytic acid which acts like an antioxidant and reduces the risks if cancer, diabetes and inflammation. It also inhibit the growth of tumor cells, and strengthen the immune function of the body. It contains much more iron and zinc than other food. As a result, it is important in the prevention of deafness for elderly people. Recent research show that soy can also lower risk of prostate, colon and breast cancers, even osteoporosis and other bone health problem. One of its main benefits is that it is a complete protein and can be a good alternative to meat if you are avoiding it. 1. Bring a pot of salted water to a boil. Once boiling, add soya beans and cook until al dente. Drain and set aside. 2. In a food processor, blend the edamame, miso, tahini, oil, garlic, and spinach very well until totally smooth. Blend in the lime juice and salt until the mixture is consistently smooth. 3. Remove the dip from the food processor, using a rubber spatula if necessary. Place it on your serving dish and scatter the sesame seeds and any extra edamame beans on top. Serve with crackers and carrots for dipping.